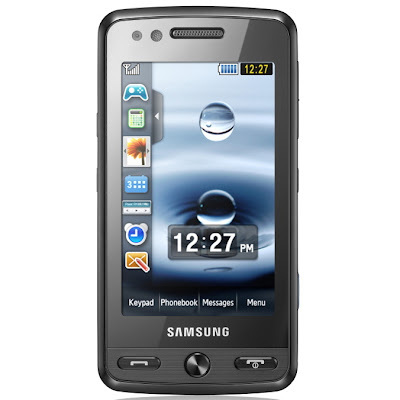 After throwing on the market one of the first 8 Megapixel camera phones, Samsung iNNOV8, the Korean company didn't relent in its race to conquer the market, and announced its successor or, better said, its rival – Samsung M8800 aka Pixon. We had the chance to try one of the samples that are making the rounds before the release of the final product, and managed to make a preview of the latest 8 Megapixel camera phone. Before reading it, however, bear in mind that the version of the device we have received is just a sample product distributed only for testing purposes, so obviously, the final product will be much better. Samsung Pixon was announced in September 2008, and will most likely become available at the end of October or at the beginning of November the latest. I'd say just in time for Christmas, for those that are in the habit of making “technological” gifts. Unfortunately, we couldn't learn the actual price of Pixon, but we estimate that one should pay between 400-500 Euros for it. At first glance, Samsung Pixon strongly resembles LG's Viewty and Prada, but one look closer and you'll immediately notice some major differences. Pixon is much slimmer than Viewty, and has a more generous display. In fact, Samsung Pixon is the slimmest mobile phone to feature an 8 Megapixel camera, at only 13.8mm. You would expect it to be rather big and heavy with such a large display and camera, but its measures (107.9 x 54.6mm) and weight (121g, including battery) make Pixon the “90x60x90” standard for 8 Megapixel camera phones. The phone has a few external buttons and only 2 ports. Besides the camera key, there are also 2 keys controlling the volume and the zooming level when accessing the camera interface, and a dedicated Gallery key, all placed on the right side of the phone. The left side includes the microSD port, Shortcuts key (opens a small menu with most accessed functions) and the Hold key (locks/unlocks the touchscreen). On the bottom right of the phone, there's an eyelet that should help users keep the stylus that comes with the device. On top of the handset, you'll notice the well-known Samsung universal proprietary port. There are only three keys below the large screen: the Accept/Reject call keys and a rounded button that functions as a Back (not Home) key. Above the display, there's a small secondary camera for video-calls, an ambient light sensor and the earpiece. I was thrilled when I discovered that the phone featured a metallic finish but, at the same time, I was disappointed by the fact that it's a fingerprint magnet. Moreover, the large screen is very easy to soil, while the back cover, which is very well polished and shines, will be dirty most of the time. Anyway, every cloud has a silver lining, and the large screen, which occupies most of the front part of the device, doesn't catch fingerprints so easily. However, you must wipe it after every call if it touches your ear. The back of the phone features the 8 Megapixel camera with flash and a small loudspeaker. I noticed that the metallic back cover was pulling out somewhat too easily, and you risk losing it if you're an active person. All in all, I've been positively impressed by Pixon's compact construction. I enjoyed the fact that it offered such a high-end camera and a large screen in such a pocket-sized form. Samsung Pixon embeds a 3.2-inch TFT touchscreen, supporting 262k colors and featuring accelerometer sensor. The colors displayed on the screen are well-balanced, contrast is very good and brightness can be set to any desired level. Moreover, it's perfectly visible in the sunlight, which is a wonder for a Samsung device, but we're talking about a high-end phone after all, so it should have been pretty obvious. I was very happy to find that the phone featured the Haptic technology, so the feedback when using the touchscreen is cool to experience. Furthermore, the haptic feedback is very responsive and realistic, so touching a key displayed on the screen is like actually pressing it. The haptic feedback can be turned off/on from the Settings menu. The only drawback I noticed was a little lag when the accelerometer sensor is activated and the screen is turned in landscape mode, but I'm sure this will be corrected in the final version. The 8 Megapixel camera features flash, autofocus, anti-shake digital image stabilization and geotagging support. It has some protective lens cover that opens when the camera button is pressed. I was disappointed by the LED flash, as I expected Samsung to include a Xenon flash. Consequently, don't bother to make night pictures, unless you are really close to the subject. The maximum resolution of the pictures is 3264 x 2448 pixels, while movies can be recorded using a maximum resolution of 720x480 pixels. Camera interface is like nothing you are used to, and more user-friendly than with any other Samsung device. You are always 1 or 2 clicks on the touchscreen away from any setting or function of it. Even if it's just a sample version of the product, quality of the pictures is exceptionally good. The shots included below reveal astonishing pictures that cannot be compared with those taken with any other phone on the market that has less than an 8 Megapixel camera. The module camera doesn't lag, while the phone saves pictures extremely fast, even when the maximum resolution is used. You can easily take pictures in portrait or in landscape mode. The phone can record QVGA movies at 30fps with no problem, and is one of the best clip recorders on the market. Another cool option is the Slow motion function, which enables the device to capture QVGA slow motion movies at 120fps. Unfortunately, this function doesn't work well with this sample device, but it's a very nice addition to the camera. Overall, I believe Samsung's Pixon 8 Megapixel camera is one of the best on the market (can't really say for certain until I have tested all 8 MP camera phones available so far), setting a new standard for any company that targets the camera phone market with its products. Samsung Pixon features an especially created firmware that works very well with the device. Shaking control and the accelerometer sensor are very functional, and make the device more appealing and user-friendly. The Home screen has a menu bar on the left side that works just like a Windows Taskbar. Samsung's taskbar is hidden, and can be displayed after touching it. You can add or delete any programs or functions you want, by simply dragging them in or out of the bar. The phone has full customization features and can be set to look exactly as you want it. Control is easy and can be done in two ways: touch and swipe. The latter will certainly remind you of Apple's iPhone, which is controlled mostly through swipes on the touchscreen. In terms of productivity tools, Pixon features programs such as: File Manager, Calendar, Alarm (10), Memo, Task, World clock, Calculator, Convertor, Music player, Photo browser, Google Search, Google Mail, Google Maps, Access browser, Live pix, Video editor, Voice recorder, Timer, Stopwatch, RSS reader, Games, and many more. Of course, The Widget is also present and fully customizable. The phone also features a Java emulator, which supports almost any Java application and game. Phonebook accepts up to 2,000 entries and around 500 SMS messages. The phonebook can be displayed according to the user's choice, contacts found on the phone's memory only, or from both the phone and SIM memory. Samsung Pixon features HSDPA (7.2 Mbps) technology, besides the usual EDGE (Class 10, 236.8 kbps). Although the NetFront 3.4 Internet browser works like a charm, EDGE speed is lower than expected. Pages are loaded pretty fast with this updated browser, and users can take advantage of the large screen, landscape mode or the mini-map function, which can be controlled with the zooming buttons on the right side of the phone. Other connectivity solutions include USB 2.0 and Bluetooth 2.0 with A2DP support. The phone can also be used as a modem with a PC in case you need one. I could only use the built-in GPS receiver with the geotagging function of the camera. It’s a pity, but the Google maps localization doesn't offer too much. Besides the basic message support (SMS, EMS and MMS), the email client is compatible with POP or IMAP accounts. Furthermore, you'll be able to set the email client to check for new messages whenever you feel like it. There's also a dedicated Gmail application that can be found in Google menu. The quadband (GSM 850 / GSM 900 / GSM 1800 / GSM 1900) network compatible device has very good GSM signal reception, but mediocre when using the UMTS network. The sound is excellent, very clear and very loud when set to maximum volume. I haven't experienced any drops in signal reception, or missed a call while talking on the phone. Vibration is pretty intense, so you'll have a low percentage of missed calls even when the Silent profile is activated. My guess is that Samsung Pixon features a powerful ARM11 family processor that runs at speeds up to 369 MHz. The CPU is the strongest embedded into a Samsung mobile phone, so you can run multiple applications in the background with no problems whatsoever. The embedded Java emulator can handle any compatible large-size files, so 3rd party applications can be installed with ease. The phone comes with 200 MB internal memory, but features a microSD memory slot card to expand the storage space up to 8GB. The slot is placed on the left side of the phone, and a microSD card can be inserted without the need of powering off the phone (hot-swappable). Samsung Pixon features a touch compatible music player that supports MP3, eAAC+, WMA, AMR files, but also an FM radio with RDS function. Both can be run in the background, or you can set their shortcuts on the taskbar in the home screen. The phone comes with excellent earphones (made in China), but also with an adapter that enables users to attach any 3.5mm headphones. The sound quality of the music player is way above average. In fact, you could expect such high quality only from those Walkman series devices made by Sony Ericsson. The music player features an equalizer: Rock, Pop, Jazz, Classic, Dynamic and Surround. The last one proves to be an innovation as the phone can be attached to a 5.1 channel sound system through a 3.5mm jack. Pixon comes with a 1000 mAh Li-Polymer battery, which has an official lifetime of approximately 290 hours in standby mode, and 3 hours and 40 minutes in talk-time mode. For a heavy user that spends 2-3 hours a day talking on the phone, it needs to be recharged daily, but a soft user should do just fine with one recharge at 3-4 days. Overall, this is a high capacity battery of small dimensions that barely adds to the weight of the phone. Alas, this is also available for its autonomy.